International Human Rights Day falls on the 10th of December each year, and a significant event set the stage for the occasion at the United Nations. A petition bearing a remarkable 1.5 million signatures was delivered to the Office of the United Nations High Commissioner for Human Rights (OHCHR). The petition asks the UN to initiate further investigations into forced organ harvesting from imprisoned Falun Gong practitioners in China, and to call upon China to immediately end this crime against humanity. A delegation of doctors and legal experts from three continents hand-delivered the petition to the United Nations in Geneva, Switzerland, on December 9. The delegation was comprised of volunteer members of an NGO called Doctors against Forced Organ Harvesting (DAFOH). 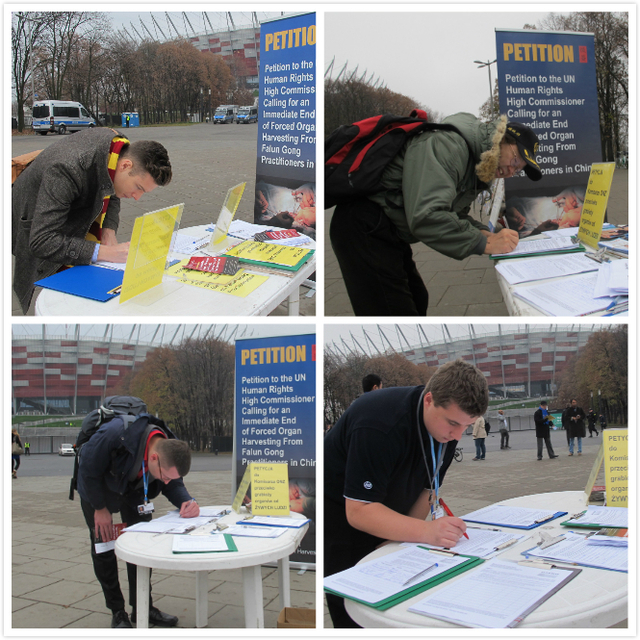 The 1,493,202 signatures are a result of a global DAFOH petition campaign from July to November 2013. The signatures come from more than 50 countries on 4 continents. Dr. Torsten Trey, president of DAFOH, said,"We came as a strong delegation with doctors and lawyers from 6 countries to respectfully represent the 1.5 million people who appealed to the UN High Commissioner to turn the tide of silence and help end forced organ harvesting in China." The world has seen a surge this year in concern over this issue. Many governments are evaluating options to enact new laws to ban organ harvesting and organ tourism, following the example of Israel and Spain. Bills and resolutions have been proposed in major countries around the world. 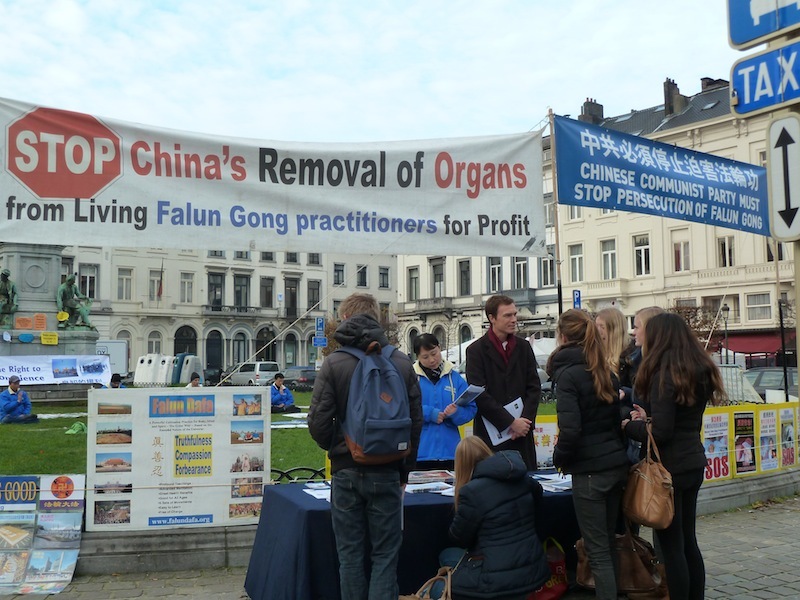 Falun Gong practitioners in Europe held a two-week signature drive outside the European Parliament to urge the Parliament to help stop forced live organ harvesting in China from the end of November to December 5. The Amnesty International Cardiff branch (AI Society Cardiff) held a signature drive and organ harvesting re-enactment on November 28. They scanned the signatures and sent them to DAFOH right after the event. Professor Irwin Cotler, Member of Parliament and former Minister of Justice in Canada introduced new legislation on December 6 to combat organ harvesting. Once passed, the legislation will penalize those who, inside or outside Canada, are knowingly involved in organ harvesting. A pending US resolution introduced during summer 2013 condemns the systematic, state-sanctioned, forced organ harvesting from prisoners of conscience in China, a large majority of whom are Falun Gong practitioners. 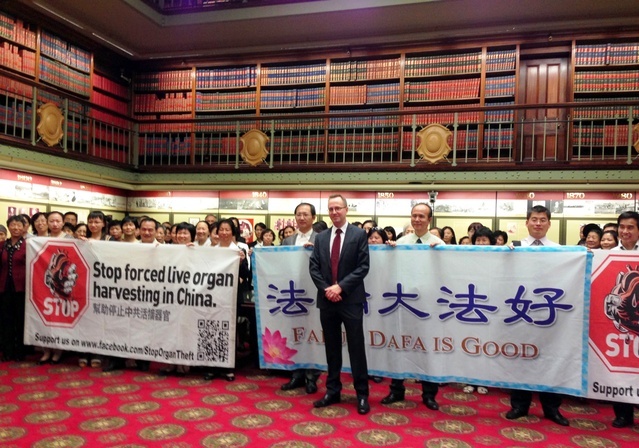 Falun Gong practitioners delivered a petition letter with more than 70,000 signatures against organ harvesting to David Shoebridge, Member of the Parliament for the State of New South Wales on November 27, 2013. A great number of hearings and forums have taken place in legislative bodies in countries and regions including the US, UK, France, Germany, Australia, Sweden, and Taiwan. More organ transplant experts have stepped forward to testify that organ harvesting in China indeed exists. It has taken many years for the world to take notice of forced live organ harvesting from Falun Gong practitioners in China. The news first broke in 2006 when two witnesses from China came forward. One was a reporter, and the other was the wife of a doctor who conducted numerous surgeries in which he harvested the corneas of Falun Gong practitioners. Through their independent investigation of organ harvesting in China, David Kilgour, former Canadian secretary of state for Asia-Pacific, and renowned human rights lawyer David Matas published in 2009 “Bloody Harvest: The Killing of Falun Gong for Their Organs.” They concluded that between 2000 and 2005, nearly 41,500 unidentified organs used in transplants in China had been harvested from Falun Gong practitioners. US Department of State Country Report on Human Rights for China for 2011 stated that Overseas and domestic media and advocacy groups continued to report instances of organ harvesting, particularly from Falun Gong practitioners and Uighurs. Finding the Matas & Kilgour report convincing, UN Special Rapporteur on Torture and Special Rapporteur on Religious Freedom sent a joint request in August 2006 and again in 2008 to the Chinese regime asking them to explain the source of extra organs, as the significant increase in organ transplant operations coincided with the beginning of the persecution of Falun Gong. They received no response. About 800 signatures from the representatives of 102 nations and European Union (EU) agencies were collected within four days during the Warsaw Climate Change Conference 2013 of United Nations in mid to late November. Under mounting pressure from the pending US resolution and the public condemnation of China's organ harvesting crimes, the regime announced in September its intention of phasing out the harvesting of organs from executed prisoners by 2015 and the introduction of the China Organ Transplant Response System (COTRS), a computerized organ-allocation system. DAFOH also pointed out that the CCP promised to end using organs from executed prisoners before the 2008 Olympics Games, but it didn't happen. Five years later, it is now talking about “phasing out.” Moreover, the regime continues to cover up the core crime of live organ harvesting from innocent Falun Gong practitioners. What Really Happened to These Two Falun Gong Practitioners?